Sometimes, the craziness of life can cause us to want to sleep in and put the world on hold so we don’t have to face the hard things in life. We often find ourselves with no help and no hope – feeling all alone even when there are kids or crowds or family all around us. We want to be heard, to be appreciated, and to be helped through these difficult times. 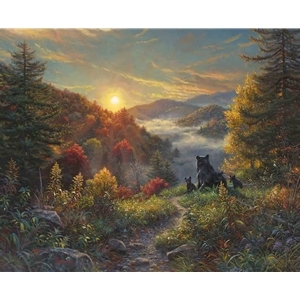 I want this painting to remind you that His mercies are new every morning! All that we ever need is right at our fingertips… no, it is right inside us. We are encouraged to put on all the things that are available to us in Jesus. His joy is readily available to flow through us. The next time you wake up and life hits you like a ton of bricks, take a moment to look into the LIGHT, “The Life that is the Light of Men.” Receive from Him all He has to offer. He loves you. He adores you. He wants to help you. You are His delight. It’s a NEW DAY!